The construction industry can experience unexpected challenges that lead to delays and additional expenses. While, some commercial construction problems are out of your control, there are some that you can prevent for your project to go as smoothly as possible. While you may be tied to a deadline, you also have to be realistic. In the long run, it can save you time and help you stay on track. Finances are another frequent culprit for commercial construction problems. It’s usually not a matter of accidentally going over budget. Costs may have changed, someone may have made a calculation mistake, or the client ran out of money. Prevention is as simple as double-checking numbers every step of the way and being very clear and upfront about projected costs and payment expectations. Not everyone understands construction lingo, and even those in the industry may have different interpretations. Communication is key in avoiding hurdles and being successful. Ask the customer for detailed descriptions. Make sure everyone involved is on the same page and updated on progress and changes. Have a lawyer review the contract, as well, to prevent any legal disputes. Your company’s reputation isn’t the only one that matters. All subcontractors must meet the same high standards of quality and professionalism as you. Working with the best in the industry will help keep the project going as planned. If hiring new subcontractors, request to review a portfolio of their past work. Determine if the industries they’ve served in the past align with your current project. When you are behind schedule, the final items on the list may suffer. It won’t help your client to have a beautiful, well-crafted exterior but a poorly designed interior. 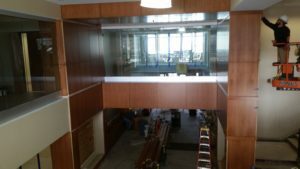 The woodwork, furniture, and other details of the building’s insides are just as important in representing the business and making an impact on those who enter. Whether the setbacks you face were avoidable or not, or you want to reduce their likelihood even more, partner with us to work with your design team so that every item finishes on time and within budget.